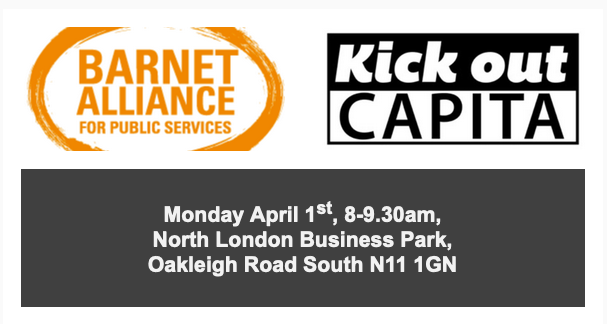 From Barnet Alliances for Public Services (BAPS) and Kick Out Capita who have campaigned vociferously for out-sources services in the Tory Flagship London Borough of Barnet to be brought back in-house. This is a landmark decision and perhaps a warning to other boroughs. Monday 1 April is officially the first day back into Council employment for former Capita Finance and Human Resources staff. This will mean Phase One of the Capita review has been completed. After years of campaigning, BAPS and the #KickOutCapita campaign invite you: Join us to welcome back the workers who return in-house There will be cake and Welcome notices, feel free to bring your own placards. All welcome! However, we also want to send a very clear message to Barnet Council that we want to see the swift return of all the former Council services, currently provided by Capita, back in-house ASAP. At the moment councillors are considering bringing back the services in phases over 18 months: Phase Two: Highways & regeneration (scheduled to be discussed in Policy & Resource committee in June 2019) Phase Three : Estates, Social Care Direct, Safety, Health and Wellbeing, Strategic planning, Procurement, Insight, Cemetery and Crematorium, Revenues and benefits Phase Four: Customer services, Information Services (IT), Planning (development management and enforcement), Regulatory services, Transactional HR services (including Payroll and Pensions Administration), Any other remaining services. But we think that the proposed time scale is dragging the process far too long. Other councils like Southampton, Blackburn and Darwen, Sheffield and Birmingham all in-sourced the services within a much shorter time.